JUPITER, Fla. - Many talented golfers use the Minor League Golf Tour to keep their game sharp during off weeks. In fact 78 players that have status on the PGA Tour or Web.com Tour in 2018 have competed on the MLGT. Associate Editor for GOLF.com, Dylan Dethier, believes that tournament reps are important which prompted him to write this. PGA Tour and Web.com Tour winners like Ryan Armour, Derek Fathauer, Ben Silverman, Justin Hicks and Brooks Koepka have all competed on the Minor League Golf Tour. 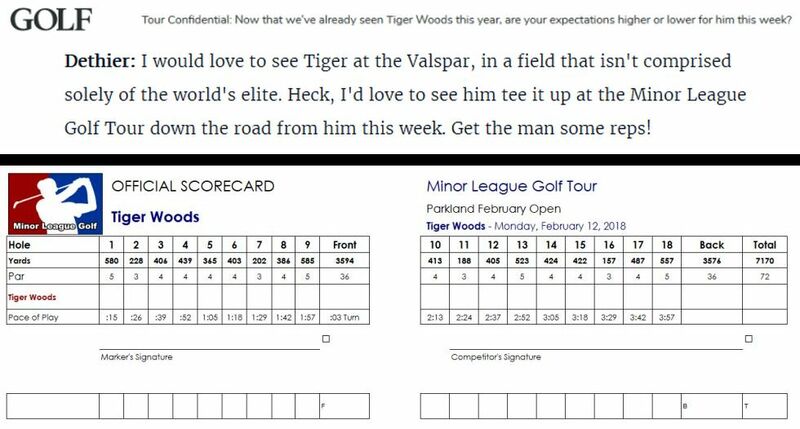 With Tiger Woods living just a few miles away from the Jupiter based mini tour, maybe Dylan Dethier's proposal isn't as crazy as it sounds!